Just outside Vicenza is a large U.S. Army base, and that's where we are for the week. Elliott has an annual training course for the Public Health Command (which includes the Veterinary Corps). We'll be here at this training course until Friday morning. 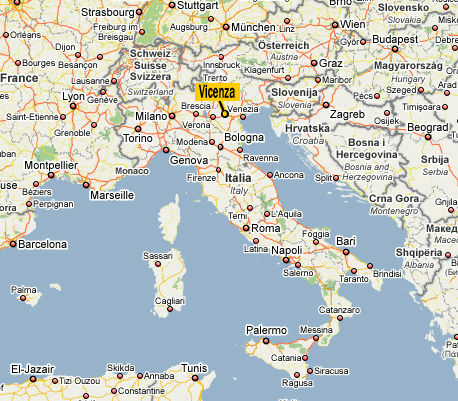 At that point we're relocating to a studio apartment in Venice, where we'll spend a long weekend. We caught glimpses of Venice from the airplane window yesterday. Wow. Venice has always been a watery, magical mystery in my mind. Are all the roads really canals? How does all that architecture stay up? Is it a murky place of mossy stone steps and quiet alleyways reminiscent of Vivaldi "Summer" concertos or is it hot and overcrowded with chubby tourists? Soon I'll know the answers to these questions, but until then, the glimpses of glistening waterways and piercing spires, a shadow in the bright morning sun against a sparkling Adriatic, will keep me dreaming. i LOVE IT! and the bow in her hair!